President Trump’s mandated report on overhauling the U.S. Postal Service drew a tepid response from lawmakers on Tuesday, as the agency’s own leadership rejected many of the key proposals. One key area of disagreement between the administration’s recommendations and lawmakers’ vision for the agency surrounded the future of collective bargaining at the mailing agency. Trump’s postal task force, which he created through executive order last year, proposed the Postal Service join the rest of government in not allowing its employees to negotiate over pay. Multiple members of the Senate Homeland Security and Governmental Affairs Committee rejected that suggestion, while David Williams, a recently sworn-in member of the agency’s board of governors, said he could think of “no way at all” such an approach would address the most significant drivers of USPS’s precarious financial situation. 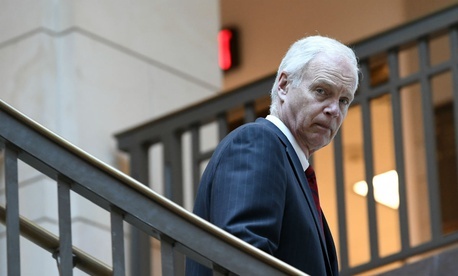 Sen. Ron Johnson, R-Wis., who chairs the committee, was skeptical of that suggestion, noting analysis from the task force that suggested FedEx, which does not have unionized delivery personnel, pays its employees significantly less than the Postal Service. Williams said USPS’ own numbers did not line up with that analysis. All parties at the hearing demonstrated some overlap over their thinking on postal issues. They agreed USPS is in dire financial straits and in desperate need of reform, but it should remain a government agency. The White House previously pitched privatizing the Postal Service, but Office of Management and Budget Deputy Director for Management Margaret Weichert made no mention of that proposal during her testimony on Tuesday. The task force also declined to recommend privatization. Still, members of both parties raised concerns about the report. Republican senators speculated that a recommendation to create far fewer constraints for “commercial” mail would disproportionately lead to higher costs for rural constituencies. Members of both parties requested more insight into the analyses that went into the task force’s recommendations and suggested the administration failed to use proper models. Gary Grippo, the Treasury Department’s deputy assistant secretary for public finance and one of the leaders of the postal task force, said without intervention the Postal Service is at risk of being unable to pay its employees within the next three years. He called for a “fundamental new business model” that does not simply shift around the agency’s obligations. He said his group had no interest in closing post offices, ending service to all addresses in the country or charging disparate rates based for rural customers. He argued, however, that a popular, bipartisan proposal to require all postal retirees to use Medicare as their primary form of health care coverage would shift postal liabilities to taxpayers. Such a move, he said, would break with the mandate that the Postal Service remain self-sufficient. Weichert, too, said the administration was “categorically opposed” to anything that would shift USPS away from self-funding, which she suggested Medicare integration would do. Grippo also argued there was no rationale for providing a government protection for postal offerings that compete against the private sector, such as package delivery resulting from ecommerce. He said that essential activities, such as person-to-person correspondence or package delivery, as well as pharmaceutical delivery, should continue to receive government-protected lower rates. The Treasury official and task force member also broke with lawmakers and postal leadership in recommending the Postal Service not take on any new business unrelated to its “core competencies.” Bipartisan postal reform bills have called on the agency to develop its nationwide retail network for new revenue streams. Weichert, lawmakers from both parties and others testifying at the hearing, such as Robert Taub, chairman of the Postal Regulatory Commission, all called for more details from the task force. They said the administration, in conjunction with Congress, should more clearly define what the universal service obligation to deliver to all addresses means in the 21st century and better explain what services would qualify as essential.